I recently had the honor of being invited, along with three other Cornell students, to design a formal dinner honoring the donors who endow the Architecture Art and Planning Deanship, which is currently held by Kent Kleinman. 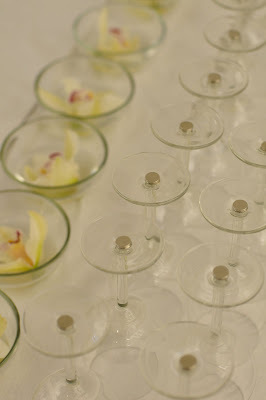 We were given four weeks to conceive, design, and fabricate the event, specifying any aspect of lighting, decor, furniture, and even the food if we saw fit. 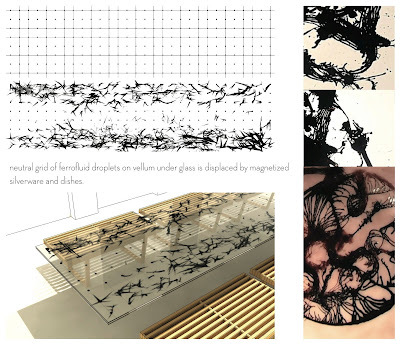 After a brainstorming charette to formulate concepts, we settled with the dean on one idea: a transparent table containing within it a grid of ferrofluid droplets. Ferrofluid is a colloidal suspension of nanoscale ferromagnetic particles: in other words, magnetic liquid. This fluid has been used to great aesthetic effect by the artist Sachiko Kodama. 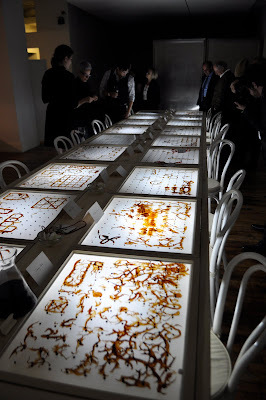 Our design for the event called for magnets to be attached to the dishes, so that upon their placement or movement, the perfect grid of droplets would be disturbed, leaving ink-like traces on the undersurface of the transparent table, serving as a canvas and an index of the events and movements of the dinner. The table was fabricated in a week, with great help from the Cornell Architecture Shop, and the dinner was held in Cornell AAP’s New York City studio on September 20th. The table was lit from below by appropriated studio lamps. View the full album of the project here. The table is continuing to evolve post-dinner, being utilized as a work table in the studio space (and offering a unique way to doodle with magnets during class). Congratulations to the design team. 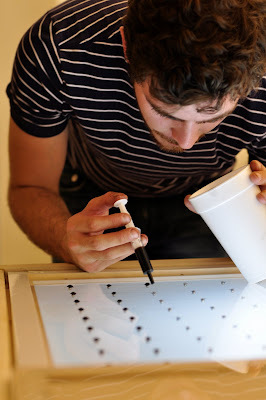 Somehow this project really caught my attention… its nice to see someone using Ferro for something cool! Excellent work!